We were blessed this week to have a priest celebrate Holy Mass since all the other priests are on retreat. Not only were we blessed to have a priest but we blessed to have Father R. enrich us with his homilies on love for the Holy Eucharist. How wonderful it is to listen to a priest speak of his love for the Body and Blood of Christ. Today, he said that after receiving Holy Communion, we are to think of ourselves as the sacred vessels. We are a Ciborium...we are a Chalice. How true! Father also told us that it is not by our own actions that we find ourselves at daily Mass. It is actually God who guides us there. How beautiful! He also enjoined us to prepare ourselves and to receive Jesus in a worthy manner. We do need to prepare ourselves before Holy Communion and it would be a good idea if we arrived at Mass early so that we can properly spend some quality time with Jesus. We should receive Holy Communion reverently. We should be quiet and focused only on Him who will become part of us and we of Him. After Holy Communion as we return to our seats, we should be in quiet meditation, pondering the awesome event that has just taken place. My own God, humbled Himself and allowed me, a sinner to receive His precious Body and Blood! If we make it a practice to be more reverent, it will become second nature to us to be reverent. We will love and understand the monumental act and sacrifice by our God and we may shed tears reflecting on His love for us. In this way too, let us make reparation for those who blaspheme Him. It is not only students at now infamous universities that have no reverence for God and who mock and scorn Him. Sadly, there are those who feel that unless Holy Communion is offered at a Traditional Latin Mass, the Mass is illicit and therefore will not receive Holy Communion. How this arrogance must hurt our dear Lord! The individual Catholic who receives Jesus in the sacrament of the Holy Eucharist shows reverence in many ways. The most important reverent attitude is that the communicant be in a state of grace. Any Catholic who is unfortunately in the state of mortal sin is bound to go to confession and receive absolution before approaching the Eucharistic table. The Council of Trent declared that it is necessary "by divine decree to confess each and every mortal sin" (Council of Trent, DS 1680). And the 1983 Code of Canon Law says clearly: "Individual and integral confession and absolution are the sole ordinary means by which the faithful, conscious of grave sin, are reconciled with God and the Church; only physical or moral impossibility excuses from such confession, in which case reconciliation can be obtained in other ways" (Can. 960). Pope John Paul II in his April 7, 2002 Apostolic Letter, Misericordia Dei, requests bishops and priests to do everything possible to make individual access to the Sacrament of Penance readily available to the faithful. It is therefore to be deplored that in more than one parish, many people regularly go to receive Holy Communion but rarely or ever go to confession. And some of them may be walking around with the weight of mortal sins on their consciences. Some such people are misled by erroneous views that very few people are able to commit a mortal sin, or that one lone act cannot be a mortal sin, or that they need not bother following what the Church's teaching authority declares a mortal sin (such as abortion, contraception, premarital relations or euthanasia) but that it is all right to just follow their own conscience. The Catholic who wants to show genuine reverence to the Holy Eucharist will make sure to be in a state of grace before approaching the Eucharistic table. 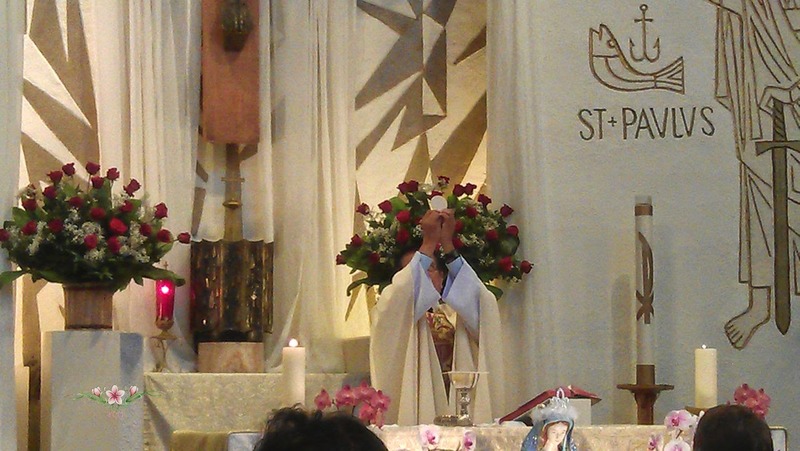 We also show reverence by the way we receive Holy Communion, kneeling, standing, on the tongue or in the hand. Even how we dress, how we walk, and how we share in the congregation's acts of singing, standing, sitting, listening and kneeling can show our faith. Personal prayer prepares us for proper participation in the Liturgy and helps us to savor its fruits. This applies particularly to the reception of the Holy Communion. Bearing in mind that "the sacred Liturgy does not exhaust the entire activity of the Church" (Sacrosanctum Concilium 9), we appreciate the need for personal reflection and meditation, internal prayer, continuing conversion of heart to God and ever greater desire of union with Christ. These are promoters of reverence for so great a mystery. According to personal devotion, a communicant may wish to kneel or to sit in quiet thanksgiving after Communion. Both the priest celebrant and the choir should make room for this. And the Diocesan Office for the Sacred Liturgy should not try to regiment movements at all such moments. "Let go of my book!" Unless there is an alternate internet universe you visit, you know that Jennifer Fulwiler's much anticipated conversion story/memoirs, has been released. I received my book yesterday and already I am finding it hard to put down. At the present I am on Chapter 4. But I can tell you, she is a very amusing, entertaining and interesting writer. I think I was on the second page and she had me chuckling. 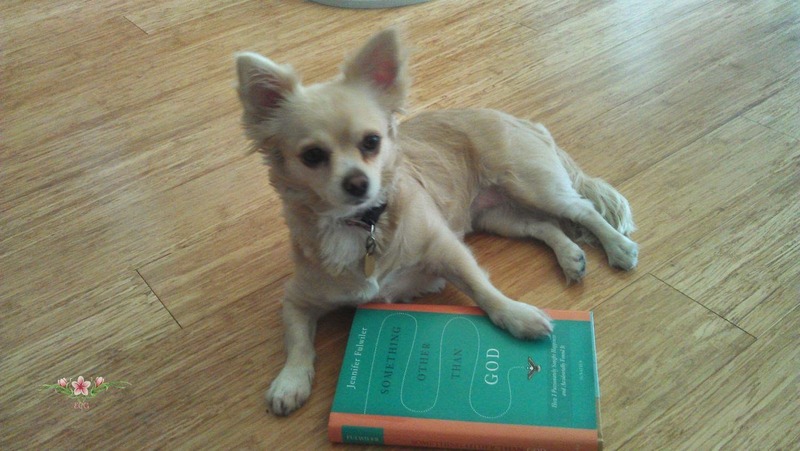 I won't ruin the book for you, (I actually can't, being only on chapter 4) but I will encourage you to read the story of how an atheist became a devout Catholic wife and mother. SOTG can be ordered on Amazon in both hardcover or for your Kindle device. 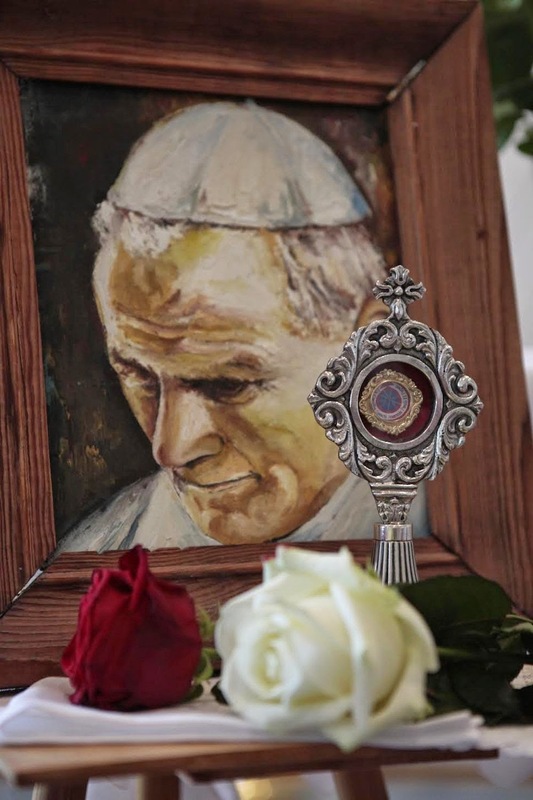 The Archbishop of Lviv, Mieczysław Mokrzycki, has presented international catholic pastoral charity Aid to the Church in Need (ACN) with a relic of Saint John Paul II. At a Holy Mass celebrated in the head office of the charity in Königstein on Monday, May 5, Archbishop Mokrzycki handed over the relic, a lock of hair from the Pope, who died in April 2005. Together with Pope John XXIII, Pope John Paul II was canonized on April 27, 2014, by Pope Francis in Rome. “He will help us by the power of divine mercy to transform the cross into the light of resurrection." Archbishop Mokrzycki expressed appreciation of the new Saint "as a man like us who was profoundly connected to God." At the same time the Archbishop of Lviv thanked ACN for its solidarity and help over the past few months and asked for prayers for a quick and peaceful solution to the present conflict in Ukraine. Pope John Paul II had a close friendship over many years with Aid to the Church in Need and its founder, Father Werenfried van Straaten. The two churchmen had known one another long before Karol Wojtyla became Archbishop of Krakow in 1964. As a representative of the Polish Bishops' Conference, the future Pope had repeatedly approached Father Werenfried to advance aid projects for the Catholic Church in what was then communist-ruled Poland. The young Archbishop of Krakow received support from ACN in 1967, among other things, when he managed to push through the construction of a church in the Krakow district of "Nowa Huta" (New Steel Mill), a workers' estate for an iron and steel works combine planned by those in power as a "city without God." Archbishop Mokrzycki, who comes from Poland, was second secretary to John Paul II from 1996 to 2005, a job which he continued to perform under Pope Benedict XVI. In 2007 he was initially appointed along with the Archbishop of Lviv, Marian Cardinal Jaworski, to be Coadjutor Archbishop of the West Ukrainian diocese. After his predecessor retired due to old age he took over complete responsibility for the archdiocese as of autumn 2008. Aid to the Church in Need maintains close relations with the Archdiocese of Lviv. The charity has supported the Roman- and Greek-Catholic Church in Ukraine for years. Between 2003 and 2013 the sister churches in Ukraine were funded to the tune of $65.7 million. The money was spent on 2,198 pastoral projects, including the renovation of churches, the training of pastoral workers and subsidizing the subsistence of priests and members of religious orders. In the words of ACN’s Executive President, Baron Johannes Heereman, "We want to strengthen the role of the Christian Churches as a peace-making force in Ukraine, but we do not support any political position or party."